“Djenne Terracotta Equestrian (13th-15th cent)” by Franko Khoury – http://africa.si.edu/exhibits/resources/mali/works.htm. Licensed under Public Domain via Wikimedia Commons. With the fall term wrapped up, it’s time to reflect on some of the great content student editors have added to Wikipedia. This week we were excited by Dr. Kate Grillo’s course at the University of Wisconsin – La Crosse on African Archaeology. Student editors contributed articles related to archaeological sites across Africa, and these articles have been viewed 75,000 times since the course started! 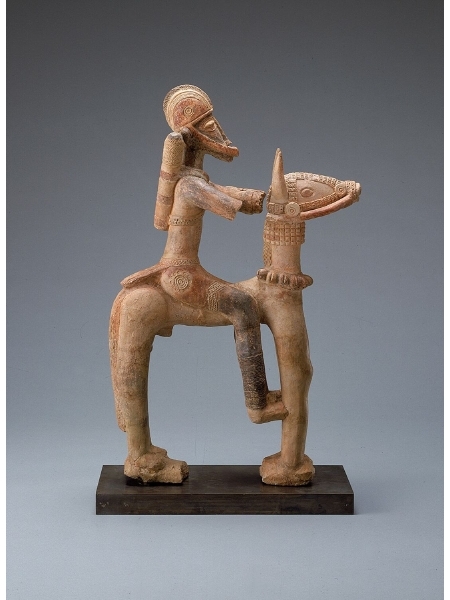 Student editors contributed interesting historical information about terracotta figurines to Djenne-Djenno, about trade routes in Chibuene, and other topics related to Jenini (new! ), Mumba Cave (a DYK!) and Kintampo Complex (both four times longer), the Kariandusi prehistoric site (new), Songo Mnara, and the rock art of Uganda (new), to highlight a few. Thanks go out to these student editors for contributing excellent content for Archaeology enthusiasts!